We take the first generation top of the line Vortex Razor HD scope for a full review. 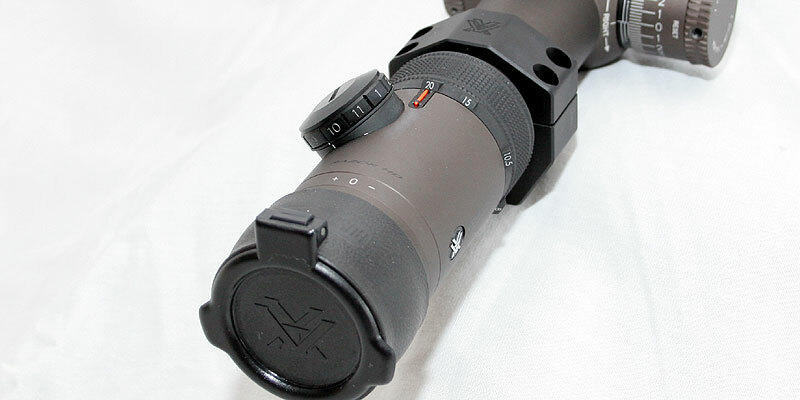 We have reviewed a few other Vortex scopes already, such as the Viper 3.5-10x50mm and the Viper PST 4-16x50mm. But we had not yet reviewed their top of the line tactical rifle scope, known as the Vortex Razor HD. We have had our fair share of experience with this scope and have had students use them in our classes, but we had not yet ran one through a complete test. These scopes are fairly popular in the tactical community and an opportunity came up to where we could use one for a few months in order to perform a full evaluation, so we took it. The scope we were able to review here is the Vortex Razor HD 5-20x50mm with EBR-1 reticle. Vortex has quite a few different lines of rifles scopes that fit just about any budget and they have also fully embraced the tactical scope movement with a large number of tactically suitable scopes. The Razor HD is considered the top of the Vortex line of scopes and it is their ‘Halo’ scope, promoted as being the premier scope on the market for tactical use. To us, the dimensions of the Razor HD would classify the scope as part the “Large Tactical Scope” category. Many of the higher end tactical scopes are a part of this “large” genre of scopes and they tend to get larger with each new evolution. The Razor certainly has plenty of mass to it, weighing in at over two pounds and is nearly 16″ long without the sunshade, and when combined with the large external turrets, it looks even larger. But this size and heft does come with added features and benefits as we will get into later on in this review. Examining the scope for the first time gives the impression that it is a scope of high quality, this is due partly to the nice fit and finish and partly due to the physical size of the scope itself. The Razor HD comes from the factory well equipped with accessories that most scopes do not. There is the normal instruction manual and warranty information, which states that their “VIP” warranty is a lifetime warranty that they will fix or replace the scope at no charge, no matter what happened to the scope or who was at fault and you do not even need to fill out a warranty card. The warranty is also fully transferable. This is about as good of a warranty as can be provided from a manufacturer. We have had no experience with the service department to know how good they are, but hopefully the folks working there will back up the excellent warranty program. Also included with the scope is the standard Allen wrenches needed to slip the rings, a 4″ sunshade, a set of flip up scope caps, an Anti-Reflective Device (ARD), and a level bubble. Sunshades are included with a few other high end scope brands such as Nightforce, and it is nice to not have to spend the extra on such a simple addition, and the same can be said about the flip up scope caps, which again, other companies such as Leupold include. But the ARD, which is a honey combed device that attaches to the objective end of the scope to prevent reflections from giving away the shooters position, is not typically included with a scope nor is the level bubble that attaches to the scope to help the sniper to insure the rifle is straight up and down. These extra items are nice features that most scope companies, especially the high end ones, typically do not provide and charge extra for. It is nice to see Vortex include them as standard items with the scope. The scope tube is milled from a single block of 6061-T6 aircraft grade aluminum. Of course, as one would expect from a high end scope, it is sealed and made waterproof, fog proof, and shockproof. The scopes are purged and filled with Argon gas to help prevent any fogging on the internal lenses of the scope over a wide range of temperatures. All of the lenses are fully multicoated and covered with what Vortex calls ArmorTek that is designed to help prevent any scratches or chipping on the glass. The tube is finished in hard Anodizing that is earth brown in color, something a little different than most black scopes and a color that will match just about any camouflage pattern. The markings on the scope are done in a combination of off-white and black. The tube is a 35mm diameter tube which is one of the new oddball larger diameter tubes, along with 34mm, that provides extra room for lots of vertical adjustments. It does also add size and weight to the scope, though an argument can be made that it adds strength as well. 35mm rings are needed which are available from some of the high end ring manufacturers including Vortex. The ocular eyepiece of the scope is a fast focus style eyepiece that will adjust through the entire diopter range in 1.6 revolutions. It was odd that there was no dot or other indicator on the eyepiece to give the operator a reference point in which to note where it should be for each shooter on a sniper team. It does have a nice textured surface on it to help with being able to get a firm grip on the eyepiece to rotate it in order to adjust it. The eyepiece rotated smoothly through the entire 1.6 revolution range. In front of the eyepiece is the illuminated reticle control knob. It is offset to the left about 45 degrees from vertical which allows the shooter to be able to easily see where the elevation knob and magnification ring are set. The illumination rheostat has 11 different brightness settings with an “off” setting between each power. Having an “off” position between each setting is handy for allowing easy and quick turning off of the illuminated reticle yet providing the ability to instantly return to the exact power setting the scope was previously set to. The knob has a low profile and remains out of the way for the most part. The clicks of the knob are stiff and have a good positive detent for each setting on the control knob. Just in front of the illumination control is the magnification control ring used to set the magnification of the scope. One feature that we at Sniper Central have always liked about the Vortex scopes is that they took the time to develop a system to allow the shooter to easily glance up and see what magnification setting the scope is set to without having to move away from behind the scope. Vortex does this by having raised protrusions at several places on the magnification control ring that stick up with the power number clearly visible by the shooter while behind the scope. It just takes a quick glance up and it is obvious what power the scope is set on. Granted, with a first focal plane reticle like this scope has, it is not nearly as critical for the shooter to know the power the scope is currently set to, but it is still a nice feature. There is a red fiber-optic indicator dot on top of the scope to provide a reference point for the power ring and it shows up very nicely. The fiber-optic gathers the ambient light to give an illuminated look to this indicator dot. When the available light gets dim, the dot is still visible, but without the glowing effect when there is more ambient light to be used to illuminate it. The power ring itself has aggressive knurling, or texturing, on it to provide excellent grip in all weather conditions whether the shooter is wearing gloves or not. The protrusions with the magnification setting numbers on them also act as gripping surfaces to add even more positive grip. The magnification power ring rotates smoothly through its entire range as well and there is a decent amount of resistance to allow it to stay where the shooter puts it, but not too much as to cause the shooter to have to change position in order to get enough leverage to apply the required force to adjust it. The elevation and windage knobs are of the external variety and are large in size. The elevation knob itself is even taller and wider than the windage knob. There is knurling at the top of the knob to give the shooter a good gripping surface to twist the knob and make adjustments. There are clear indications marked in white on the knob with each full MOA being clearly marked with a number and each of the .25 MOA marks being marked with a smaller hash line. The wider diameter knob does allow for this clear marking which is especially important as there are 25 full MOA of adjustment per revolution of the knob. This is enough to allow the adjustment for a 308 Winchester shooting a 175gr Sierra Matchking bullet at 2600 fps to be able to go from 100 to 800 yards, depending on environmental conditions, in a single revolution. This should help a sniper team avoid the ever dreadful “full revolution off” error that plaques so many shooters when going from long range to short range. This large MOA per revolution combined with the zero stop should all but eliminate these problems. The scope also has 125 MOA of elevation adjustment which provides ample adjustments to be able to do extreme range shooting as required. There is also another fiber-optic mark on top of the elevation knob to allow good visual indication to the shooter of where the knob is set, though this feature may be of limited benefit as the number markings are right below the indicator mark and are just as visible in low light condition, and the orange dot is not visible when the knob is rotated away from the shooter. The clicks on the elevation knob are very nice with a positive tactile feel but with a muted sound, ideal for tactical work. As mentioned, the elevation knob has a zerostop feature that is one of the nicer zerostop setups we have seen on a scope. Once the system is understood it is easy to adjust and very precise and positive. There is a second knob beneath the main knob that can be loosened and shifted once the desired zero is achieved. This allows the precise setting of the zerostop to be done so there is no guess work or shims involved. Again, it adds size and weight, but it is an effective system for setting the zerostop. When it is set, the operator only has to rotate the knob down until it “Stops” at the set zero, which will then be your original zero point, whether it is 100 yards, or some other distance. The windage knob is a similar size and shape as the elevation knob, but not exactly the same. It is not as tall and not as large in the diameter, primarily due to the lack of a required zerostop mechanism under the knob. There is still the same 25 MOA of adjustment per revolution and the knob counts up in both directions, a feature we continue to prefer here. With the 25 MOA of adjustment per revolution, this means the overlap starts at 12.5 MOA, enough to provide shooting the same 308 round mentioned above in a direct 10 MPH crosswind out to over 1100 yards without overlapping on the windage knob. We are not sure if it is the same on all Razor HD scopes, or just our sample scope here, but the clicks on the windage knob are more “sharp” with a “tingy” sound which is harsher than the nicer clicks on the elevation knob. It is not a huge difference, but noticeable when paying attention. The side focus knob is a smaller knob than the windage and especially the elevation knobs. The knob is marked for parallax free ranges from 40 yards to 500 yards and then a final mark at infinity. Most of the modern high end tactical scopes have gone away from marking exact ranges as they tend to be off slightly due to shooters eyes, and various other factors. But during our tests, the ranges appeared to be fairly accurate and we have no issues with the way the knob is marked. It adjusts smoothly through the entire range and provided good accurate adjustment for focus and clarity. The objective on this scope is 50mm in diameter which is small enough to allow mounting the scope low to the rifle to help with eye alignment. There is a four inch long sunshade that comes with the scope that easily threads onto the objective end of the scope providing the benefits of helping reduce mirage from a heated barrel as well as reducing any likelihood of a reflective glint giving a snipers position away. Provided the shooter is not looking directly at the sun or a light source, no reflective glint will occur. The scope does also come with an Anti-Reflective Device (ARD) from the factory, but we have never been a fan of these unless there is not a sunshade available for a scope. The ARD’s distort and disrupt image quality and hurt light gathering ability as well, but they do prevent reflections as designed, we just prefer to use a sunshade. For our shooting tests, the scope was mounted onto a Weatherby Mark V varmint rifle chambered in 7mm-08, which we were reviewing at the same time as the scope. The scope was mounted using Vortex 35mm tactical rings which themselves are a very high quality ring. We conducted several shooting sessions during the morning hours of summer conditions in Montana, which typically consisted of 60 degrees and sunny with minimal wind. The initial battery of tests include shooting the box at 100 yards, putting a group at each corner of a 6 MOA box and checking to see that the controls tracked precisely and that the scope ended up where it started with the first group. The box seemed to shoot fine without any noticeable issues. We then like to do a 20 MOA measured result, shooting one group, moving the windage 20 MOA to the left, firing another group and then bringing it back to zero. We then measure the spread and see how close to 20 MOA the groups are. Because group sizes are not one hole, we have to go center of group to center of group which does introduce a margin of error into the test. Typically if the 20 MOA test is within 3% or less, the scope adjustments are doing well. For the Razor we performed the test three times and then took the average which measured 20.44″. At 100 yards 20 MOA measures 20.94″, making the error 2.4%. Not as tight as we have seen on others scopes, but within the acceptable range. We had an experience where the return group on the initial 20 MOA test was not right on top of the original group. It was not drastic, about one MOA low, but it caused some concern that the scope may not have been tracking perfect. It seemed to settle down after that initial test, but this was the reason we shot this test multiple times to see if the behavior was repeatable. The HD portion of the Razor HD name refers to the High Density glass which is a higher quality glass that equates to extra low dispersion. This high quality, more expensive HD glass leads to better image quality. Most of the high end tactical scopes are using HD glass, though some do not advertise it as such. The low dispersion qualities combined with index lens matching will equate to better brightness and clarity and the Razor HD does indeed have a very bright and clear picture with very good light gathering ability. This was apparent during early morning low light shooting conditions at mid ranges where the optical quality really shines. The reticle is located in the First Focal plane which means that it will grow and shrink with a change in the magnification so that it will always be the correct size when taking MIL, or in this case, MOA measurements on a target to do range estimation or holdoffs. 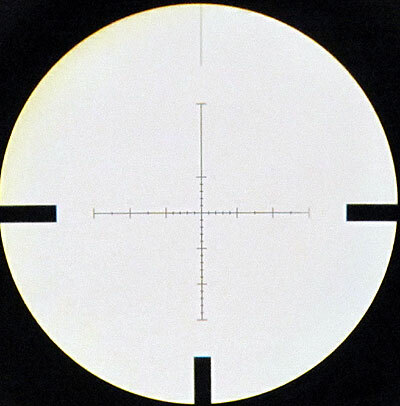 The EBR-1 reticle is a simple and clean design with hash marks indicating various MOA measurements. The thickness of the stadia are just about perfect for the zoom range, being thick enough at low magnifications to still be seen, yet not too thick so that at high magnification they cover too much of the target to prevent precise aiming. The scope can also be ordered with MIL knobs as well as different MOA or MIL reticles to match the adjustment knobs. The function of the reticle performed well in both field and range conditions. When looking at the scope as a whole, it is a very solid offering in the high end scope market. The scope is large and heavy so if a team is trying to keep weight down, this is perhaps not the scope of choice. But with plenty of elevation adjustments, a wide zoom range of 5-20x, and very good optics, it could serve well on a long range platform. We are a little concerned about the tracking of the scope, but we did not see enough repeated bad behavior to raise the alarm bells yet, but we will keep our eyes on it. Vortex does stand behind their product so if there was, or is, any problems, they will insure they are corrected. We do like some of the features like the precise zerostop and being able to see the magnification setting from behind the scope and especially the 25 MOA per revolution. All and all, the Razor HD is a solid offering from Vortex in the high end market. Since this review was completed, have you observed any tracking issues with the scope? I ask this because I have been considering buying one, and you indicated in your review that you would be monitoring the scope for such issues. We have not. It seems to have been a weird anomaly with this one scope. We have had several of these scopes come through our classes as well and they have tracked well. I have the same scope except with mil turrets/mil reticle on my custom 6.5×47 Lapua. Once initial load testing was done, I sighted it in and POI has never moved in 6 months that I have had it. I shoot from 100 Yds to 1,000 Yds and it always comes back to zero perfect. I like this scope so much I bought another for my custom LR 308. Last year a hunter came hunting here in south africa and by luck he ended up hunting baboons on the farm i work and he had a 7mm sniper rifle with this exact same scope and he gave me the opportunity of a liftime to shoot with that scope and i was mesmerised because i never thought a scope would be so amazing. Well done to the people making these optics, you guys realy know your work. Maybe oneday if it is meant to be i will have the money to buy me a scope like this. Thanx agian to Vortex for that amazing experience your scope gave me. I have this same scope on my custom 300 win mag. I shoot past 1200 yards easily. I bought it to replace my nightforce nsx. No regrets here. bonjour es ce qu on peu tire avec cal pour tir a plus de 2000 verges ? There are not many “small caliber” rounds that will reach out to 2000 yards, but the 338 Lapua and cheytac are two options. The 300 Win Mag with 220gr and 2800+ fps could stretch out that far in good conditions, but would struggle. bonsoir es ce que 5-20×50 RAZOR HD peu tiré a plus de 2500 metres sur 12,7 cal ?? lorent wants to know if a 5-20×50 Razor HD would be suitable to shoot beyond 2,500 meters on a .50 cal. Can anybody chime in ? It can be done, but a lot will depend on the size of target you are engaging at that range. For man size tactical work we typically recommend 1x for every 100 meters/yards. So for 2500 yards, a 25x. But it depends a lot on skill and size of target. Yes, it can be done, but it will take some work. Thanks Mel. I will try to translate that to French language one of these days, just in case lorent drops by here. Bonjour, lorent. Mel dit qu’il c’est possible, mais beaucoup dependra de la taille de la cible. Pour une cible avec la taille d’un homme (application tactical) , nous recommandons un aggrandissement de 1x pour chaque 100metres ou yards. Alors, pour une distance de 2500 yards, 25x. Mais il depend beaucoup de aptitude et la taille de la cible. Tot ca est possible, mais il est beaucoup de travail. I cannot say that I have ever dropped the scope to see if it holds zero, but the Razors are really high quality and durably built, I would suspect that it would do okay. Brandon above asked if this scope is made in China. I would like to know that answer also (refuse to buy from China when possible). 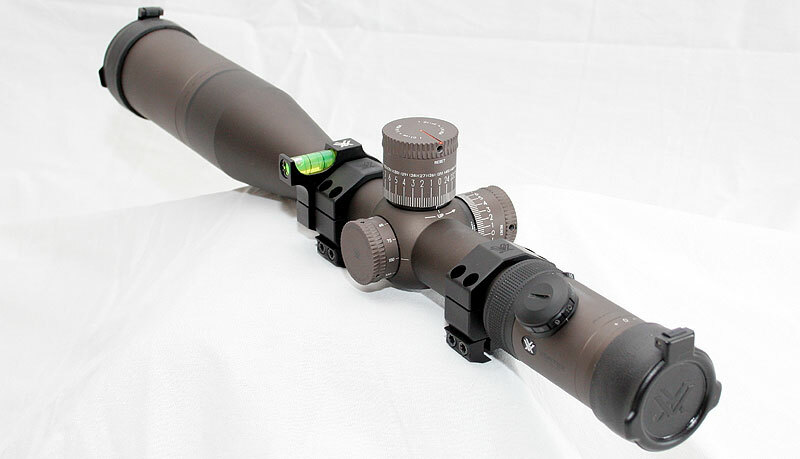 The vortex razor hd is the vortex premier line of scopes and all the scopes in that series are manufactured in Japan. The diamondback and viper series are made in the Philippines and the crossfire series behind those are made in China. This is the scope I wanted. I ended up with the gen ll which is only 71moa on elevation adjust. Can I add to the elevation with taller rings? And or what type of base should I be trying to put on? No, the elevation is limited by internal mechanisms so there is nothing you can do to add more elevation. You can use a canted base so you can use more of those 71 MOA (instead of only half of them), but you will still be tight for 1 MILE. Depending on what ammo you are using and weather conditions, but you will likely need 70-80 MOA of up. You may not be able to get there with this scope AND have a 100 yard zero.